Why not try our Pilates and Tai Chi sessions. We offer a 15min consultation with our Osteopath free of charge. Prepare your feet for Summer using either the services of our Chiropodist or Foot Health Practitioner. Boost your immune system using our Homeopathy services. If you want to make changes to you life our Hypnotherapist can help you. Are you nursing a sports injury? Suffer no more with the help of our Sports Massage Therapist or see our Osteopath. Contact reception for details and prices. I have been to the chiropodist and he was brilliant! I also regularly use the services of Alex, the accupuncturist, who has changed my life. I suffer from rheumatoid arthritis and have a back problem. I am now a lot more mobile and can now keep up with my grandchildren. I have had years of chronic pain and tried all sorts of treatments over the years. Went under the care of Osteopath Peter Alison at Meridian around 7 months ago. The one thing Peter gives you, other than very effective treatment, is TIME. My treatment is never rushed and Peter also takes time not just to treat the physical side of my pain but also any root causes. I have felt such a difference since this treatment. Peter has made a big impact on my painful illness and given me the chance to look beyond pain and look towards a better future. I visit the chiropodist - Andy Haywood at Meridian Healthcare and after every visit my feet feel refreshed and rejuvenated. Andy is always pleasant, efficient and friendly. I recommend anyone to try. Great to find a range of services in one convenient location. I have used a number of the practitioners at Meridian and have always received excellent treatment leading to relief from painful problems. Thank you - highly recommended. After numerous trips to my G.P. + 2 admissions to hospital, I was diagnosed as a migraine sufferer. I had visited Meridian Healthcare previously with a back problem so asked Peter for a second opinion. Over the last year I have undergone treatment to release tension in my body (not migraine at all!). I now have lots more energy, no longer suffer from headaches or period pains and I have much lighter periods too. I have also been attending The Pilates and Tai Chi classes which have complimented my treatment extremely well. Osteopath, Peter Alison, takes time to look beyond the immediate pain and tackles both the physical and mental problems to help you to understand how the underlying issues can affect your body. Pleased to be able to recommend Peter and Meridian Healthcare Hinckley to others. I have used Meridian Healthcare for several years on and off to sort out health issues. It is amazing what they do, in particular Peter (Osteopath). He has sorted out my problems including frozen shoulders, neck pain, lower back pain and dizziness all without medication. If you are in pain or suffering with a medical issue you can't resolve make an appointment with Meridian Healthcare. I have always received fantastic attention and help with keeping mobile at Meridian Healthcare Hinckley. It is a very caring practice with friendly staff members and I would recommend them to anybody. The Osteopath - Peter Allison, has transformed my life and made me mobile again. Thank you. Peter Allison at Meridian Healthcare works wonders on pain infested bodies! The whole of the team at Meridian really make visits an enjoyable experience. I met Kate at the gym and we soon got talking about training, fitness, running and of course injuries. A keen runner, at that time I had been punishing my self with long hard training runs and my legs were in bits. No stranger to the benefits of massage I asked Kate to have a look at me the following week. She got to work on my legs giving me a good deep tissue massage. Quite simply I hobbled into to see her with pain in my legs and an hour and half later I walked out feeling great. The next day was the biggest transformation, I felt no pain in my legs and I felt so good I was able to go back out on another hard training run. During my own competitive career I ran at an elite level with access to a top team of support professionals including physio’s and therapist’s. I can honestly say that in my professional opinion, formed over 21 years working in the health and fitness industry, that Kate is without doubt exceptional and the ‘best’ therapist I have worked with. Only been here twice and omg, the work these people do is amazing. Sorted a bad shoulder I had, best money I have ever spent, highly highly recommend. Last May I had to give up my job as an archaeologist due to accute back problems. Having seen my G.P. and being prescribed pain killers and physiotherapy, which just masked the problem, I looked for an osteopath and stumbled upon Meridian Healthcare. Thank God!! Mr.Peter Allison has transformed my back and my life. Sounds really corny I know but I cannot even begin to describe the difference he has made. During my twenty years "digging" I have had to use the services of osteopaths several times around the country and can safely say that Peter is one of the best. Thank you Peter and all the staff at Meridian. I am an active 71 years old and have been a regular patient at Meridian Healthcare for over 10 years during which time I have been successfully treated for one or two quite severe back conditions. I also use them for regular "maintenance" treatment that keeps me mobile and healthy. I highly recommend the caring and effective service I always receive from Meridian healthcare. Thanks Peter and all your team. My skin was left silky smooth and noticeably plumper the days after my first Environ treatment, Kris was uber professional and attentive from the start explaining all the stages and what she was doing and recommended products that would help me with my skin based on a pre facial consultation! my favourite part was the cooling facemask, looking forward for my next treatment at the end of the week! 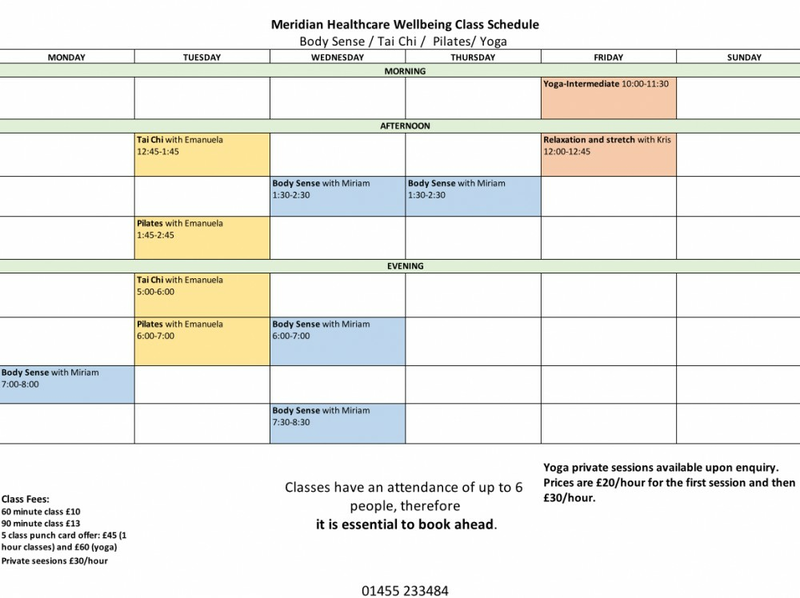 Based in the heart of Hinckley, Leicestershire, Meridian Healthcare is dedicated to providing holistic quality patient care that incorporates both Western and Eastern philosophies. Meridian Healthcare offers a wide range of treatments including Chiropody / Podiatry, Osteopathy, Homeopathy, Counselling, Body Massage as well as Hypnotherapy. In addition there are regular classes for Pilates and Tai Chi Qigong, which are suitable for beginners as well as those who are more experienced in these disciplines. Following in the holistic medicine tradition, our competent and caring practitioners treat each patient individually and therefore your treatment will be tailored to your needs, rather than fitting you around any one particular therapy. 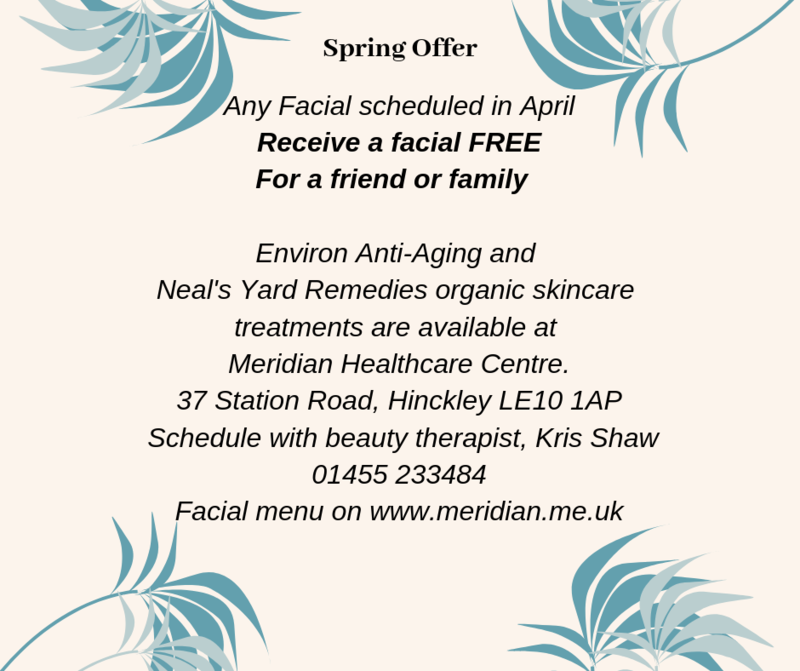 Meridian Healthcare also provides an extensive range of beauty and holistictherapies including manicures and pedicures, shellac nails. Skin care services include make-up consultation with Jane Iredale skincare, and facials with anti-aging Environ and organic Neal's Yard Remedies.